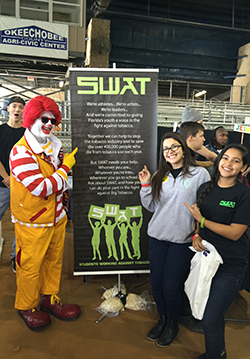 OKEECHOBEE, FL – On Saturday January 30th, Okeechobee County SWAT (Students Working Against Tobacco) members participated in the Ninth Annual Okeechobee Family Health and Safety Expo, where there were over 1700 guest in attendance and 120 vendors participating. This event encouraged the residents of Okeechobee County to learn more about healthy lifestyle practices. Okeechobee SWAT members had an informational booth that educated guest on the harmful effects of tobacco and steps they can take to stop using tobacco. SWAT members also encouraged guest to participate in an activity where the guest were asked general knowledge questions about tobacco and earned a prize for participation. The Students Working Against Tobacco Program Club is a united movement of empowered youth working towards a tobacco free future. The program is available in each county through funding provided by Tobacco Free Florida. To learn more about the SWAT club or to join a local SWAT club visit our website at www.swatflorida.com or contact Courtney Moyett, SWAT Club Coordinator at 863-801-8277, email: cmoyett@quitdoc.com.